Though a short-lived reunion in celebration of a fan-favorite album’s 10th anniversary last brought them to Nashville in 2012, it’s been over a decade since indie fixture Pedro the Lion have existed on a permanent basis, and even longer since frontman and creative core David Bazan last released any new music under the moniker (he’s had a prolific run, both solo and with new projects, in the years since). As of a few months ago, however, Pedro the Lion are back, and, ahead of a new release in the near future, are embarking on reunion tour, which returns them to Exit/In on Feb. 23 with buzzy new duo (and pseudo-supergroup) Marie/Lepanto. It hasn’t been hard to see Bazan in Nashville in recent years, but seeing him with a full band, the Pedro name, the back catalogue, and the excitement that he’s displayed towards reviving the project is truly going to be something special, and tickets for the beloved group’s return are still available here. Additionally, we’re thrilled to announce that we’re giving away a pair of tickets to one lucky fan, so read on for more about the show, and enter for a chance to win below! For all intents and purposes, David Bazan is Pedro the Lion and Pedro the Lion is David Bazan, and yet the moniker hasn’t been used for any new releases in 13 years, and hadn’t been used live, save for a 10th anniversary tour for beloved LP Control in 2012, since the group formally disbanded in early ’06. That all changed last fall when Bazan, who’s kept busy with a prolific solo career and a variety of side projects, announced the return of Pedro and his desire to be in a band full-time once more, resulting in a handful of December dates and the group’s inaugural tour back, as well as the promise of new music and a brand new record deal with Polyvinyl. If Pedro is largely an extension of its creator and frontman, then what’s all the fuss about? It’s difficult to articulate, but the project, which formed in ’95 and released its first full-length in ’98, seemed to define a style, thematic approach, and headspace for Bazan, who, while the only constant, did bring in a revolving door of bandmates and backing players, who increasingly became more involved in the creative process by the ’00s (however, no lineup really came to specifically define Pedro, and the fact that the reunion seems to involve a mix of former and new bandmates doesn’t really undercut it- it’s all about Bazan reconnecting with the moniker as well as his musical past it represents). Emo adjacent, Pedro helped perfect a slow, earnest, layered, and melodic fusion of indie and alternative rock, wrapped up in conceptual lyrics about religion and politics, among other topics, going on to influence a genre-spanning variety of acts in the mid-’00s. Releases like Achilles Heel and the aforementioned Control have come to be regarded as masterpieces of the scene, and though Bazan’s subsequent efforts under his own name didn’t deviate far from the template, despite being a bit more minimalist, and his other projects- Headphones, Lo Tom, The Undertow Orchestra, and Overseas- were all excellent in their own right, there was something so magical and transcendent about PTL, which, judging by David’s comments, is something he truly felt reconnected with enough to warrant bringing the band back. This isn’t a nostalgia grab (nostalgic though it may be), but rather the full-on return of one of indie rock’s finest bands, and getting to catch them at the moment of their return will be absolutely surreal- you don’t want to miss it. Named for an exit along I-55, roughly halfway between the Southeast Missouri and Western Arkansas towns where band members Will Johnson and Justin Peter Kinkel-Schuster grew up, Marie/Lepanto is a brand new pairing with a whole lot of pedigree. A prolific and beloved figure in the indie and alt folk scene, Johnson is known for fronting Centro-matic and South San Gabriel, as well as for his roles in Monsters of Folk, New Multitudes, Overseas, and Undertow Orchestra (the latter two with David Bazan), in addition to a long-running solo career. Kinkel-Schuster’s musical history is not quite as exhaustive (few artist’s are), but his involvement in Water Liars and Theodore, as well as some great solo work of his own, built the foundation of the pair’s mutual admiration. After visiting producer Jeff Powell in Memphis and getting their creative juices flowing, the duo felt compelled to formally cement their new project, and reconvened to craft debut LP Tenkiller, which just arrived last month. Created without the weight of expectation, the album finds a southern, folk-tinged, indie rock pleasantness that highlights each singer-songwriter’s strengths, coming across incredibly personal, conceptual, and even spiritual. They’re a great compliment to Pedro and a great new band to have on your radar, so be sure to be punctual and see what Marie/Lepanto are all about. Winner will be announced Wednesday, Feb. 21 at 2 p.m. CST, and will receive one pair of tickets. Good luck! Win Tix to Pedro The Lion at Exit/In! 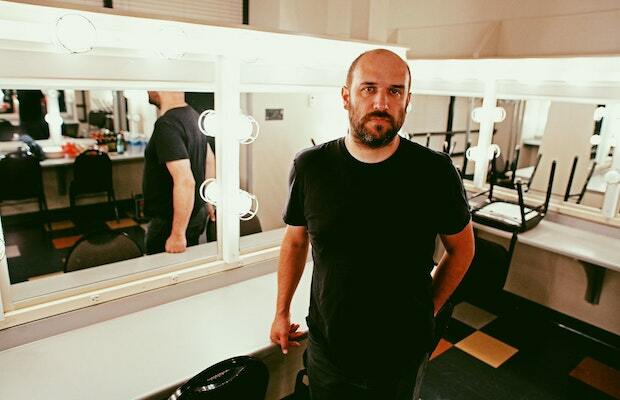 Pedro the Lion and Lepanto will perform Friday, Feb. 23 at Exit/In. The show is 18+, begins at 9 p.m. (doors at 8 p.m.), and tickets are available to purchase for $22-25.